Dish's Hopper, long the king of DVRs, just zoomed even farther ahead: it's introducing a new SuperJoey, an improved version of their client receivers to its main DVR the Hopper. The improvements? It'll be possible to record 8 shows at once. That's insane. 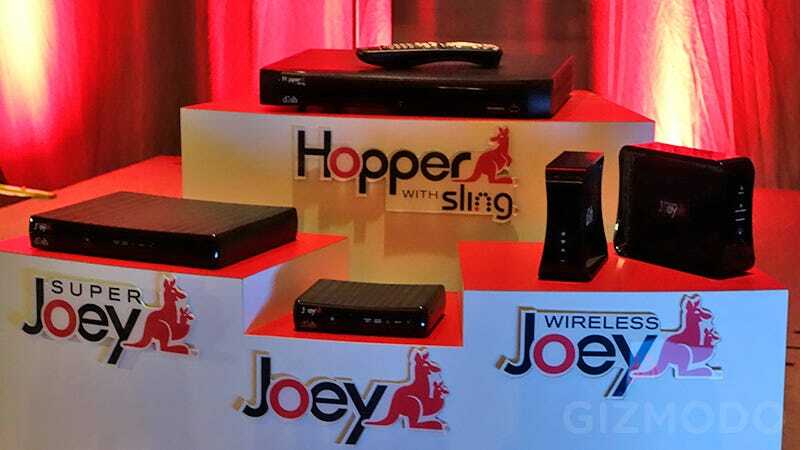 DISH has also introduced a Wireless Joey along with the ability to use Dish's Hopper DVR on a PS4 and PS3 too. The SuperJoey client adds two tuners to the three tuners already on the main Hopper DVR. So how does five tuners add up to 8 recordings at once? Well, Dish can fib with the number a bit since 4 of those 8 recordings would be recorded through Dish's Prime Time Anytime feature (where they auto-record basic network shows in primetime) and the other 4 recordings would come from the tuners (with one being left to watch live TV). If you want to record shows from any network, you can watch and record a total of 5 shows from any network (cable, included). That's a lot. You can also ditch wires now too with a Dish DVR. The Wireless Joey is a new installation that requires a Wireless Joey Access Point and Wireless Joey clients. One access point can support two Wireless Joeys through its own dedicated 802.11ac Wi-Fi network. The Wireless Joey Access Point connects to the main hub Hopper DVR, the Wireless Joey clients can be put wherever there's a TV without worrying about stringing out cables. And lastly, like the Dish app Dish made available to LG TVs, you can get the Hopper DVR experience—DVR controls and channel guides—on your PS4 or PS3, no extra hardware necessary. If you have Dish and a PS4, that's pretty freaking awesome. The Dish Anywhere app is also making its way to the Kindle Fire too. So the best gets better. More show recordings at once, a wireless option and a DVR experience on a PS4 (not to mention the tablets). You're never not watching TV when you have Dish.